Flat window glass; thickened, rounded edge. Striations on one side from production. Range of thicknesses suggests two or three different panes present. Light green to yellowish green (PMS 7485 and 608 C). Translucent. Infrequent, pinprick to small and medium-sized, spherical and elongated bubbles. 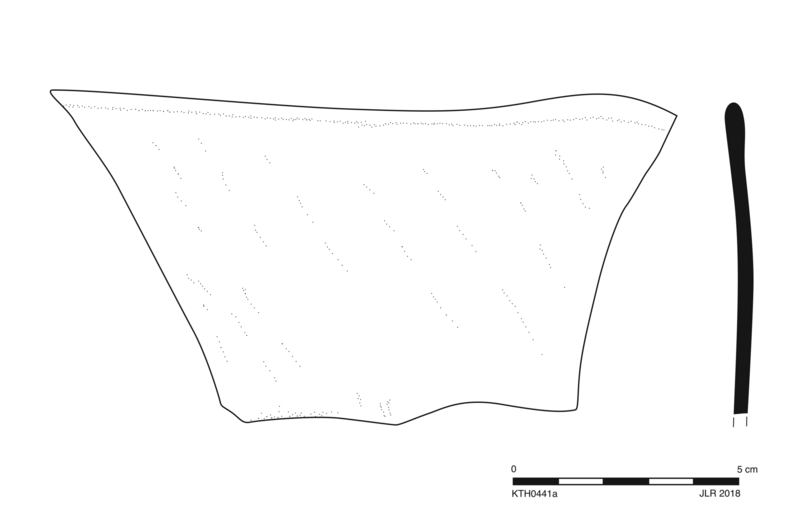 One large fragment (a) preserves a long finished edge; 22 other fragments (b-w) of same material. Slight to moderate, somewhat extensive dulling, iridescence, crizzling, and milky to silver enamel flaking; scattered patches of encrustation.